Check out Tobi's US-CASH Heeled Snakeskin Booties Strut your stuff in Steve Madden's US-CASH Black Heeled Snakeskin Booties to instantly add a dose of cool to any 'fit. 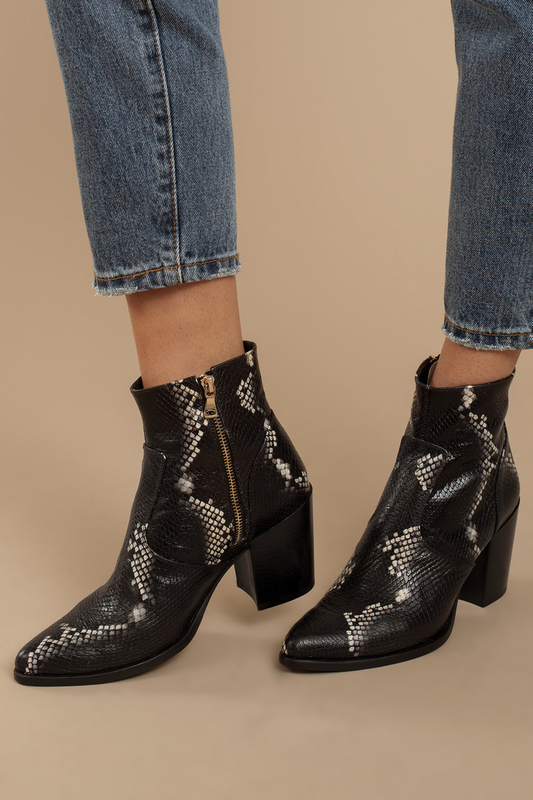 These snake print ankle boots feature a pointed toe, gorgeous faux snakeskin, stacked block heel, and a side zipper for easy wear. These snake print boots will look extra fab with high waisted ripped denim. Strut your stuff in Steve Madden's US-CASH Black Heeled Snakeskin Booties to instantly add a dose of cool to any 'fit. These snake print ankle boots feature a pointed toe, gorgeous faux snakeskin, stacked block heel, and a side zipper for easy wear. These snake print boots will look extra fab with high waisted ripped denim.